I'll post our long NAB NY interview with Mitch soon. Finishing. Panasonic Media Entertainment Company (PMEC) today announced that it is delivering its AU-EVA1 5.7K handheld cinema camera, distinguished by a pixel count of 5720 H x 3016 V (17.25 million), Dual Native ISO ratings of 800 and 2,500, and 14-stops of dynamic range. The highly-anticipated EVA1 has a suggested list price of $7,495. The newly-designed EVA1 sensor is Super-35 sized (24.60mm x 12.97mm) with 5.7K resolution. With an active resolution of 5720 x 3016, the EVA1 delivers more than 17.25 million photosites, nearly double the 8.8 million for 4K DCI (4096 x 2160). By starting at a higher native resolution, the 5.7K sensor yields a higher resolving image when downsampled to 4K, UHD, 2K, or even 720p. Additionally, the increased color information results in a finer, more accurate finished image. A key feature of the VariCam cameras, Dual Native ISO utilizes a process that allows the sensor to be read in a fundamentally different way, extracting more information without degrading the image. This results in a camera that can switch from a standard sensitivity to a high sensitivity with almost no increase in noise or other artifacts. Dual Native ISO has allowed cinematographers a greater variety of artistic choices as well as the ability to use less light on set, saving time and money. The EVA1’s Dual Native ISOs are 800 and 2,500, which will allow cinematographers to shoot in almost any lighting environment. The EVA1's 14-stops of Dynamic Range enables fine gradation in exposure from bright to dark. The ability to capture accurate colors and rich skin tones is a must for any filmmaker. The EVA1 features full V-Log/V-Gamut capture to best utilize high dynamic range and broad colors. V-Log’s wide dynamic range and V-Gamut’s color space beyond the Rec. 2020 standard offer all the information necessary to deliver rich 4K HDR imagery. Have a week long film shoot with the EVA1 coming up, and have the gear test day tomorrow. If any one has any particular questions about it? I'm just the soundie, but I'll report back what I can. Odd.... I had a play around with it today, and it doesn't tell you when it loses connection with the TC box. Neither does it have any method to explicitly jam TC, it just "does it". From the visual perspective, was reviewing some clips last night of the day's shooting and it looked beautiful. Didn't really have much time/energy while on the shoot itself in the Coromandel, now we're back in Auckland I'm going to see if I can meet up with the DoP again sometime next month. 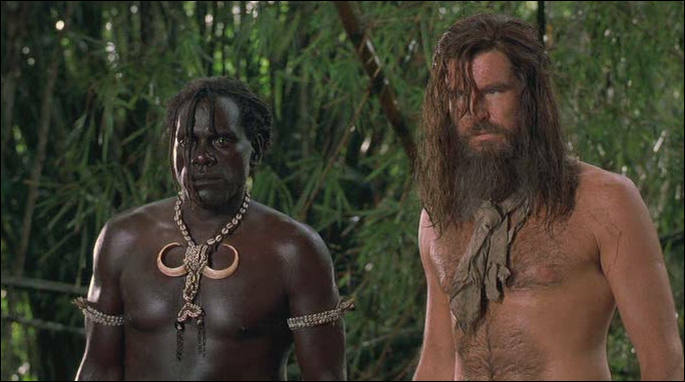 You shot Robinson Crusoe remake (DP on the left)?